I shall apologise in advance to any readers who already know this book; I'm only very recently aware of it and delighted to have found it. I love both reading and gardening so, when I find a book that encompasses both of these loves, I want to share it. 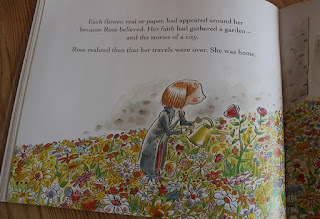 I found this book, Rose's Garden , in the children's section of my local library. It was the illustrations that caught my eye; they're reminiscent of Quentin Blake's work (a favourite illustrator) but, in fact, are the work of the author, Peter H Reynolds. 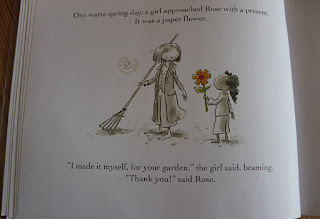 I would hope that all children love stories and being read to and I find it's a particularly nice way to start or finish a spot of gardening with children. For one thing, it makes sure you have their attention, whether you want to tell them what's planned or whether it's time to stop, clear up and go. 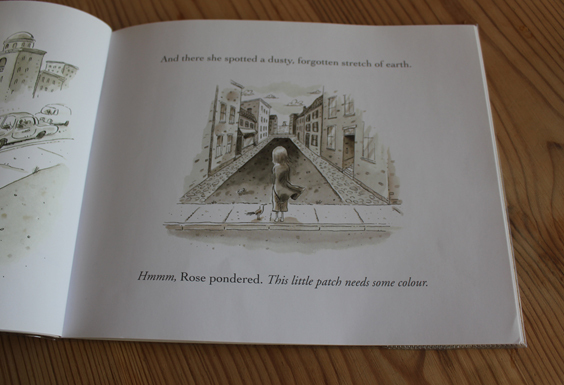 The story is a simple one about Rose, who collects seeds on her travels. When her teapot is full up, it's time to plant her garden and she finds herself in a busy city. "This little patch needs some colour." She chooses a forgotten stretch of earth and gets to work, imagining what a colourful place it could be. On returning to the teapot to get her seeds, she finds the birds have eaten them, leaving just a small handful behind. She sows these seeds and patiently waits through the seasons but to no avail. "A girl approached with a present. It was a paper flower." 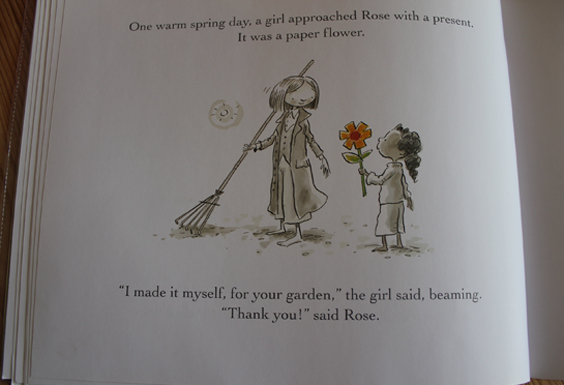 Word spreads of Rose's faith in her garden and children of many cultures bring paper flowers that they've made for her garden. Gradually the garden fills with glorious colour from thousands of paper flowers. Then, one day, Rose hears a bee buzzing and realises that her seeds have grown and real flowers are blooming among the paper ones. "Her faith had gathered a garden – and the stories of a city." I like to think everyone who gardens is doing exactly this: making friends, building communities and having faith that their work will result in colour and beauty. I'd love to believe that this story will continue to be read to children and inspire a future generation of gardeners. I love the synchronicity of the gardening world; bloggers are commenting on the first signs of spring, trees beginning to bud, bulbs pushing through the soil and anxiously hoping that a harsh but late winter isn't waiting just around the corner. I'm not going to offer an opinion on the weather as it has a nasty habit of contradicting me soon after I've published my thoughts. But I'm no different from other gardeners in getting hopeful of an early spring. Today, as I peeked out onto my balcony, I was excited to notice this tiny little patch of new growth. 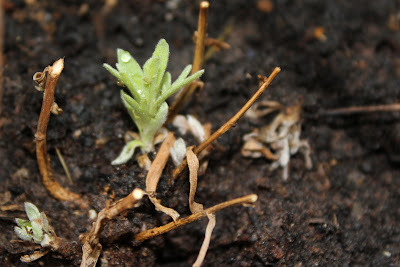 This is French Tarragon, new to the balcony last year and frankly, a bit spindly in it's first year. I thought it had died but resolved to wait until spring to make sure. Now it looks as though it will be a good, sturdy addition to the herbs at my disposal - even if it is still only one inch tall. And in case the weather turns, I have a cut down water bottle as an impromptu cloche to protect the plant if needed. 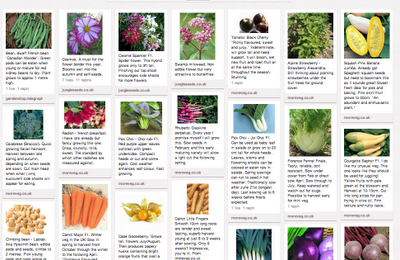 Other bloggers' posts have reminded me that I have to sow onion seed and broad beans now. (Actually, like Jo at The Good Life, I intensely disliked broad beans as a child but I'm tempted by some rather beautiful pink beans I've spotted on the internet.) Also, I couldn't find the white onion sets I wanted and one bulb had run to seed late last year so I rather laboriously dried the seed head and saved the seed. It will be the first time I've grown onions from seed, so an interesting challenge lies ahead. I may even have to invest in a little balcony sized wooden greenhouse I've seen - I think I'm going to need it now my seed list is nearly finished! Okay, officially slap my wrist. Three weeks without posting? Very remiss of me. So... what have I been up to, apart from looking out at the skies and seeing beautiful sunrises? Actually, not a lot on the physical gardening front. Apart from removing a good peppering of calling cards from local felines. (I take issue with cats pooping in my raised beds ... sorry, cat lovers out there but, seriously, it IS disgusting.) Okay, so I need to net off all my beds to prevent this type of nuisance but then the beds become less accessible. It's a lose/lose situation for me. Calendula is still flowering, so - snip, snip with my fabulous Felcos - a bit of deadheading is prolonging that. Cowslips and herbs seem to have survived last weekend's frost. Winter veg seems dormant for now, unsurprisingly, as the weather has been on the chilly side of late. And I've dug up and moved a cherry tree. I'm using the term 'I' very loosely here; my neighbour Frank dug, I directed. Community gardening at it's best. Otherwise time has been spent trying to plan what to grow in the garden this year; taking the time to reflect on the ups and downs of last year, leafing through seed catalogues, being inspired by new plants, listing what's left over in the seed box. It can all get a bit much ... but then there's Pinterest. Pinterest isn't new to me, I've had boards on this site since its infancy after one of my favourite internet illustrators flagged it up on her blog. It's a lot of fun and absolutely distracting, somewhere to keep track of inspirational internet finds - and the perfect place to keep a visual record of the seeds that have caught my fancy (with links back to where I found those seeds). Other methods I've tried include pieces of paper, small notebooks, copious post-it notes, collage pages and even paper clips. Just to digress for a moment: am I alone in getting overwhelmed by choice at this time of year? I read of gardeners knowing just what they want and getting the order in; my imagination, on the other hand, leaps from small veg patch to Versailles potager in one bound. Then I have to scale it all back down again. The actual veg patch (formerly a small area set aside in the 1940s for tenants' children to garden) now sits in a sea of paving slabs with the occasional visual relief of a rectangle of grass or two at the edges. The west side is bounded by raised brick beds built against a high brick wall which is where we've planted fruit trees (and perennial cauliflowers). One of these borders is still overgrown with honeysuckle, ivy, dogwood and other shrubs; it needs to be cleared and replanted, all in good time. My problem is my imagination and those paving slabs. I badly want to dig them up; picture the growing space that would open up. 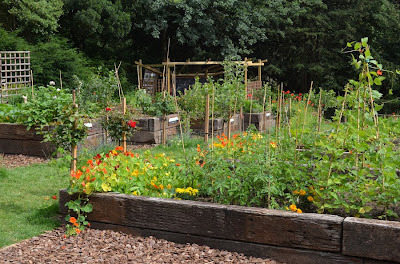 Seriously, I'm a bit obsessed about it all: I wake up thinking about how the garden would look if I could turn at least half of it (the half I garden in) into a kitchen garden, a place for people to come and sit or potter round, as I do. 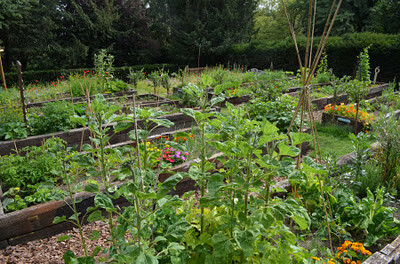 Just this morning I saw a photo online of the refurbished kitchen garden in Waterlow Park, a nearby public space in Highgate. Pictures like this make me sigh with envy. 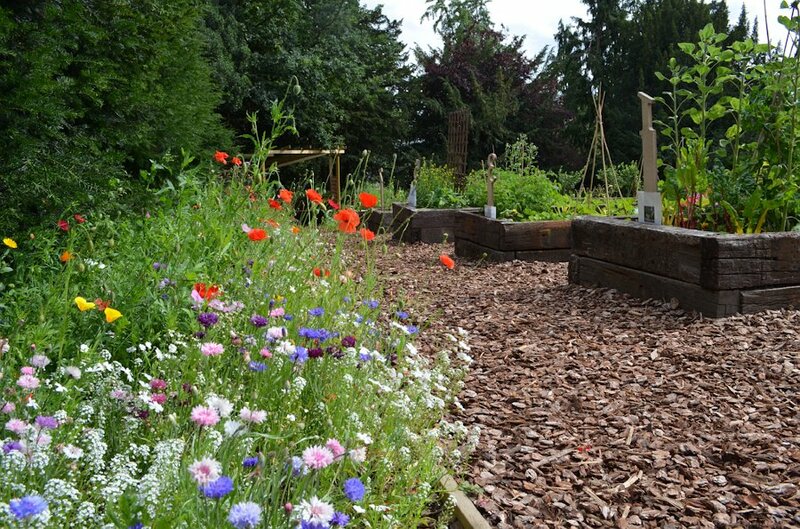 Soil tests indicated very high levels of toxins in the soil, so raised beds were built and filled with fresh compost which are leased, like allotments, to local groups and schools - there's even a wildflower border to encourage bio-diversity. I noticed recently that in the 'gardens' of another of my landlords estates, the tenants had started to remove some of the paving, presumably to create a growing area. That project looked like it had been abandoned but it does give me hope that precedent has been set and I might be able to create something really beautiful here in York Rise. In the meantime, I feel a great responsibility to the people who've lived here and overlooked the gardens for many years. If I was unable, for whatever reason, to carry on, it would all have to be left in a manageable state. I guess that means I have to resist the temptation to dig up the paving stones and move the grass... or will I? I must admit I was feeling rather glum yesterday. I sat down to write a post and it was so negative, I deleted it. I don't celebrate the turning of the year as my new year starts when the soil starts to warm and I can spend longer hours outdoors. My birthday is at the end of March - an Aries, if you believe such things - and that feels more like the new year for me. 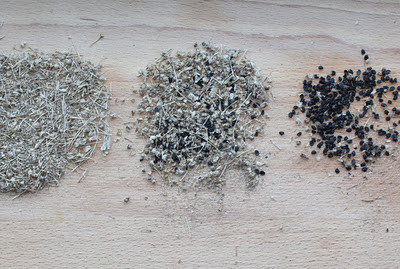 My Christmas has been a nice time to relax but I'm now ready to carry on with jobs that need doing and the first thing is to sort out my seeds and start to make plans for the 2012 veg patch. The postman brought new seed catalogues from both Chiltern Seeds and from Thompson and Morgan who have very good offers on potato tubers at the moment. (20 potato tubers for £2.99, presumably plus postage but I'll probably snap up a pack of Charlottes, my favourite salad potato.) My new Felco secateurs also arrived which was a happy moment - thank you UK Veg Gardeners! I meant to write about this yesterday but my internet was down - so frustrating after waiting for most of the holidays to get at the laptop (my son had commandeered it for his A level coursework, so needs must). It just remains for me wish everyone the very best for 2012 as we go forth and garden together! I'm looking forward to reading your blogs in the months ahead.